Create a photo memory with a magnetic photo jigsaw puzzle! Customised jigsaw puzzles from PuzzlesPrint are always welcomed gifts. They are unique because the picture or image printed on the puzzle is uniquely personal, chosen by you. Now, imagine something that can make a customised jigsaw puzzle even more unique: imagine that jigsaw puzzle being magnetic! 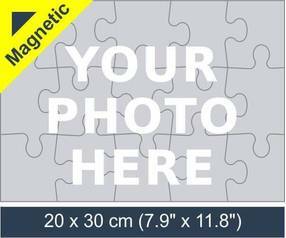 To start creating your magnetic photo jigsaw puzzle select jigsaw size and upload a photo, design or artwork! Magnetic photo puzzles – your magnetic photo memories! Have you ever visited a friend’s house and found yourself standing in the kitchen, next to the fridge, and idly (or deliberately) rearranging the fridge art magnets? Magnetic photo jigsaw is a great gift idea. PuzzlesPrint uses the picture, artwork or design you have provided to create a photo jigsaw that is affixed to a magnetic backing. The pieces can be placed on the fridge or any other metal surface (other than stainless steel). Bringing out the playful child in anyone with magnetic photo jigsaw puzzles! Just as with a regular photo jigsaw, your personalised magnetic photo jigsaw puzzle will be fun to assemble on any metal surface; the pleasure lasts long after assembly is completed when you see it magnetically clinging to the fridge or whiteboard each day. Magnetic jigsaw puzzles are particularly appealing to small children who enjoy not only the puzzle solving process but also the “sticking” factor. Small children can be happily occupied arranging and rearranging the pieces on the fridge surface while mother is busy in the kitchen. You design the jigsaw, we produce it! You are the designer of your personalised magnetic jigsaw puzzle. Magnetic photo jigsaw puzzles are available in 6 different piece counts. Our online editor enables you to upload your favourite photo, artwork or design, size and position it, add text, select the size and number of puzzle pieces and order quantity, and place your order. The PuzzlesPrint team uses state-of-the art technology and high-quality materials to produce the magnetic jigsaw puzzle. The image is transferred to a plastic surface, which is affixed to the magnetic material, then the material is die cut into puzzle pieces. Each finished puzzle is packed, unassembled, in a zip lock bag and placed inside a custom-made box with your selected photo on the box cover. Magnetic photo jigsaw puzzles from PuzzlesPrint are sure to be favourite gifts for the young and not-as-young people on your gift list.